The Cuisinart DCC-3200W is 14-Cup Programmable Coffeemaker which is equipped with cutting edge coffee technology to give you hotter coffee without sacrificing taste. Choose a flavor profile with regular or bold strength control, and set brew-time up to 24-hours ahead. Our backlit LCD is easy-to-read, a ready tone can be turned on or off, and an indicator light signals when it’s time to decalcify. 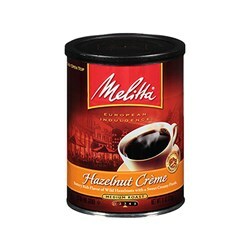 The Cuisinart 14-Cup Programmable Coffeemaker has many exciting features for users of all types. 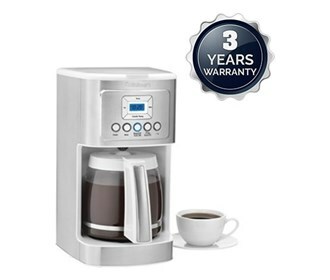 You can extend the lifetime of your Cuisinart 14-Cup Programmable Coffeemaker with the purchase of a FactoryOutletStore Factory Protection Plan. 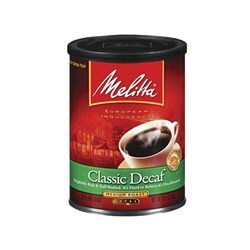 FactoryOutletStore stocks a full line of accessories like Melitta 60142 European Dark Roast (Single Pack), Melitta 60256 Hazelnut Creme (Single Pack), and Melitta 605211 Classic Decaffeinated (Single Pack) for the Cuisinart 14-Cup Programmable Coffeemaker. 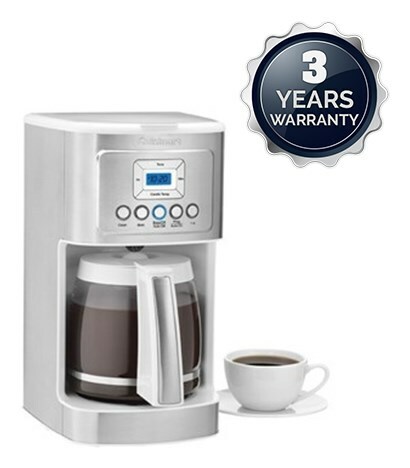 The Cuisinart 14-Cup Programmable Coffeemaker is sold as a Brand New Unopened Item.